A FRIEND OF A FRIEND JUST CONTACTED ME about a book she's working on. It's about "visual journals." I'll let her explain. "My book," Jennifer New writes, "which is being published by Princeton Architectural Press, is a compilation of contemporary journal keepers who have visual elements to their books: drawings, collage, detritus that's been glued or stuck in the pages, photos, etc. The books need not be beautiful; in fact, I'm very interested in journals that serve as a tool to their makers, helping to track a project, or process a problem. I'm trying to include as wide an array of journal keepers as possible: songwriters, archaeologists, chefs, dreamers, travelers, people dealing with illness, etc. I'd very much like to include a gardener. I have some notion of seed packets competing with dirt smudges and grids of vegetable plots." Well, you get the idea. Most gardeners do attempt a garden journal at one time or another. One year I gave myself the task of writing a page or two about the garden every week. At first I didn't know if I would have the stamina to keep it up for an entire year; I had better things to do with my time, including working in the garden. But to my astonishment, no matter how busy my life became, I reserved an hour or so each week to sit down and record the happenings in my garden. As the months wore on, I began to appreciate the time I set aside to muse over my successes and failures, to observe the changing of the seasons, and to plan the next week's or month's work in the garden. I started out recording the daily farm report in my journal: "Planted lettuce seeds. Radishes up. Mulched the flower beds." Soon, however, the entries began to span several pages, spinning epic tales of battles against predators, devastating backyard famines and triumphs against all odds. And like any other kind of journal, mine became filled with the details of my life: the illness and death of my 20-year-old cat, the coming and going of friends and family and those all-too-frequent, harried entries: "Too busy to even look outside this weekend. The garden's a mess. Weeds have taken over." No Pretty Books. Don't even consider buying one of those fancy blank books with charming little watercolor pictures, seasonal gardening tips and literary garden quotes. The daily events of your garden will seem far too ordinary for its fine pages, and you'll never crack the spine. No, what you need is a book that's not afraid to get dirty. The best garden journals get dirt-smudged, soaked by the sprinkler and left out all night where they are walked across by snails that leave slimy trails on the cover. That's what gives them character. Record Essential Data. At a minimum, try to get down the basics: planting dates, varieties, bloom times. I use a spiral-bound graph paper notebook to sketch out a plan of the vegetable garden in winter. Then I go through the seed packets I keep in a shoebox in the attic and figure out what seeds I need to buy and when I should plant them. I don't like the look of plant tags in a garden (and when I do use them, they always get lost or broken anyway), so when it's time to plant, I'll do another diagram and write down what varieties I've planted where. At the end of the year, if I'm very organized, I might go back and make a few notes about which sunflowers bloomed first, what tomato variety withstood late blight, or which lettuce matured the fastest. By winter, when it's time to start planning the garden again, I'm glad to have the notes. Make it visual. My garden journals contain no drawings of unusual leaves, no seed packets, and no photographs, but I wish they did. There's a great how-to book called Nature Journaling by Clare Walker Leslie and Charles E. Roth that is full of ideas for making simple drawings to record events in the garden. Tell a story. Write about the people who visit your garden, the plants you get as gifts and the ones that you give away. Gardens are created by people, after all, so be sure to weave a little human drama into the journal. If all else fails, lie. I have a Martha Stewart book called Gardening Month by Month that includes a monthly "journal" written, I assume, by a beleaguered and underappreciated former English major who has probably never set foot in Martha's garden. I get tired just reading this journal. The monthly entries include such unlikely activities as, "Buckwheat hulls delivered (884 sacks) and used to mulch perennial beds" and "Wooden tomato stakes painted cupboard blue." Her journal suggests one essential truth of garden journaling: You can always lie. If you get tired of writing the same old thing every week ("Pulled weeds. Watered. Pulled weeds"), you can always fall back on a few Martha-like entries of your own: "Harvested basil; whipped up 17 pounds of pesto," or "Trained ladybugs to fly in formation." Who would know the difference? I'm still collecting stories about plant orphans, those plants that get left on your doorstep without so much as a note. So if you've ever put a plant up for adoption or taken one in, me or write in care of the Journal at 145 G St., Suite A, Arcata 95521. 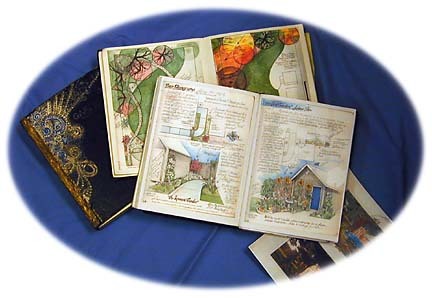 PHOTO AT TOP: This example of a garden journal is the work of ROSE WELSH, a prolific journal keeper. She is on her third volume of journals, having started in 1992 when her family's new home in a McKinleyville subdivision was surrounded by a naked lot. A graphic artist, Welsh intersperses her own color drawings and writings with magazine clippings, photos, poetry -- and an occasional seed packet. She writes about her observations, philosophy, setbacks and challenges all relating to the progress of her garden and occasionally, the life of her own family.